Reduced fat houmous. Reduced fat houmous blended with red pepper. Reduced fat houmous blended with caramelised onion. Keep refrigerated. Once opened, consume within 2 days and by 'use by' date, shown., Not suitable for home freezing. 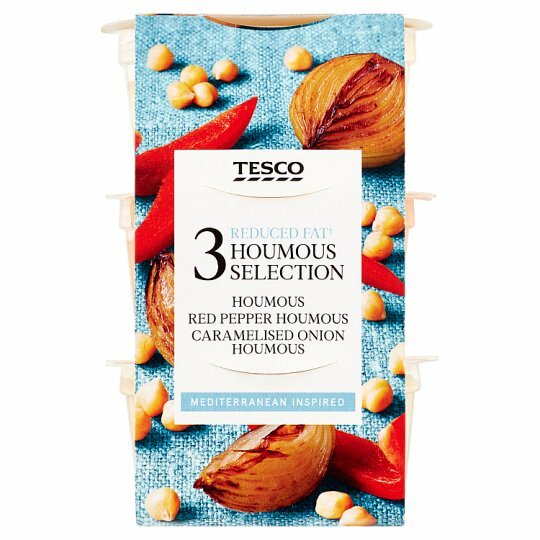 30% less Fat than Tesco Red Pepper Houmous. A Mediterranean inspired dip made with chickpeas, sesame seed paste, lemon juice and garlic. Reduced Fat Houmous blended with caramelised onion. Reduced Fat houmous blended with red pepper.